MAYBE IT WAS JUST TOO QUIRKY, too strange, too self-aware of its intent to make a BIG statement. Maybe it was just ahead of its time. Milwaukee, Detroit, Worcester, Biloxi, Boise or elsewhere. 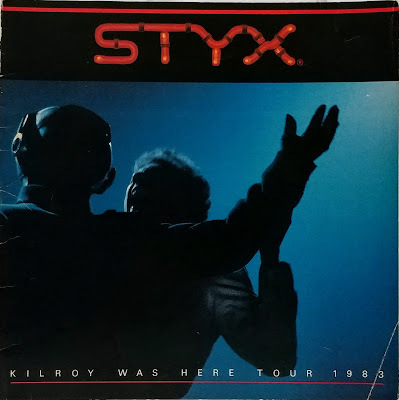 In February 1983, the prog rock/pop rock/arena rock group Styx released a concept album called Kilroy Was Here. As Robin Williams once said, what a concept. For the uninitiated, a concept album was sort of like a movie soundtrack minus the movie, a two-sided (or perhaps four-sided) vinyl LP, typically bracketed by thematically linked opening and closing numbers sandwiching a somewhat narrative song cycle. In the right hands, the results could be spectacular, think the Beatles' Sergeant Pepper's Lonely Hearts Club Band, The Who's Tommy or Pink Floyd's The Wall, all of which later became movies. In the wrong hands, you got the Planet P Project's Pink World. And you got Kilroy, a nine-song cycle about a dystopian future where America is dominated by evangelical conservatives led by the charismatic evil Dr. Everett Righteous, founder-leader of the Majority for Musical Morality and where automatons were replacing people. In that conceptual future, rock has been banned. Mobs toss records and guitars into bonfires at nightly rallies. Music's biggest star, Robert Orin Charles Kilroy, has been framed for killing a Majority member and sentenced to life in a prison where inmates are fed Dr. Righteous Fried Chicken while being watched by electronic guardsmen called robotos. As rebel Jonathan Chance plots to liberate rock and R.O.C.K., Kilroy punches a roboto guard right in the disc drive and escapes with its uniform and headpiece. He and Chance then meet at the Paradise Theater, site of Kilroy's last show, scene of the alleged crime and now a Majority museum about the evils of Jimi Hendrix, Elvis, our hero and their ilk. Robert Orin Charles Kilroy (DeYoung) reveals himself to Jonathan Chance (Shaw). This too became a movie, albeit a very short one, screened to set up the opening number at Styx concerts in 1983. Behind the self-serious concept was a genuine grievance about the rise of Lynchburg, Virginia, preacher Jerry Falwell, founder of the politically powerful Moral Majority, and about allied conservative Christian groups claiming not only was rock and roll evil, but that certain bands -- including Styx -- had laced their music subliminal Satanic messages that could only be heard of the LP was played backwards. The phenomenon was called backmasking, and while it had its practitioners, accusing the Chicago-born band known for ballads like its smash hits Lady and Babe and for life-affirming numbers with titles like The Grand Illusion and I'm OK of being one of them was farcical. Styx, which had just hit its creative and critical zenith, was not amused. Their last album, said to contain contain the hidden message "Satan moves through our voice" was also their most successful. Titled Paradise Theater, it too was a concept album, one that used the decline of the dazzling titular showplace as a metaphor for America. Striking a delicate balance between its members progressive and pop impulses, it went triple platinum, spending 61 weeks on Billboard's Top 200 -- three of them at number one -- while spinning off four singles including the Top 10 hits The Best of Times and Too Much Time on My Hands. With their 10th studio album, Styx had finally arrived and they weren't taking any crap. Still, the combination of massive success and unfounded accusations only heightened tensions between the group's pop-leaning front man Dennis DeYoung -- whose Babe was their biggest hit -- and harder rocking fellow songwriters Tommy Shaw and James Young. Their collective response was Kilroy, a 12-inch vinyl protest against Falwell, his followers and the religious right generally, with a dollop of disdain for technology to boot. It even had a backward message. The lead single, Mr. Roboto, shot to number three on the Billboard Hot 100 while firmly embedding itself in the pop culture firmament. Styx took its robot on an eight month, 59-date tour (including a three-night stand at Manhattan's City Center where I saw them), after which Shaw quit and then Young. The band went on hiatus, fitfully recombining in various lineup combinations since then, though the two dissidents reportedly refuse to play anything from the divisive album to this day. While its over the top musical premise may not have withstood the test of time, Kilroy's message was positively prescient. 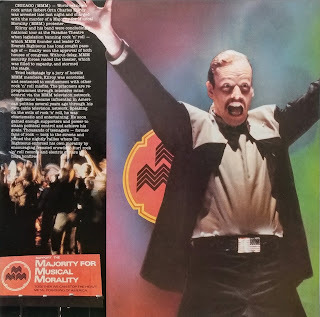 Within two years of its release, a group of Washington wives including Tipper Gore -- whose husband Al was a Tennessee senator and future vice president -- formed the Parents Musical Resource Center and began campaigning for content warning to be placed on records with risque´ lyrics. They were successful, as was the religious right, which is still a potent force in American politics. And the automatons? They're coming. Some say they're here. So just maybe Styx was right.